Барааны дугаар 9780199549351. Categories: Dictionaries, OXFORD. 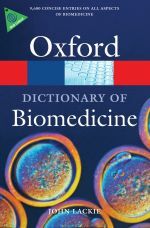 This brand new Dictionary of Biomedicine includes 10,000 A-Z entries on all areas of biomedicine. Entries are authoritative and wide-ranging, covering terms from the related areas of anatomy, genetics, molecular bioscience, pathology, pharmacology, and clinical medicine. Biomedicine – the study of molecular bioscience relating to disease – is playing an increasingly important role in medical application, diagnosis, and treatment. As molecular bioscience provides greater insights and techniques than ever before into the practice of modern medicine, there is an increasing need for an affordable dictionary covering the specialist language used within this evolving field. This dictionary, written by an expert in the field, fills this need by offering clear, concise definitions of even the most complex biomedical terms. Many entries feature recommended web links which are accessed and kept up to date via the Dictionary of Biomedicine companion webpage, and supplementary material includes the Greek Alphabet, SI Units and single letter codes for Amino Acids. Fully cross-referenced, it also features useful navigational entries for types of diseases and disorders – for example renal disorders – that list all related entries in the dictionary so the reader can find them quickly. Readership : For undergraduates and postgraduates of all biomedical and molecular bioscience degrees, including Biomedical Chemistry, Biomedical Engineering, Biomedical Materials Science, and Biomedical Physics.